Ahlen, January 2017. 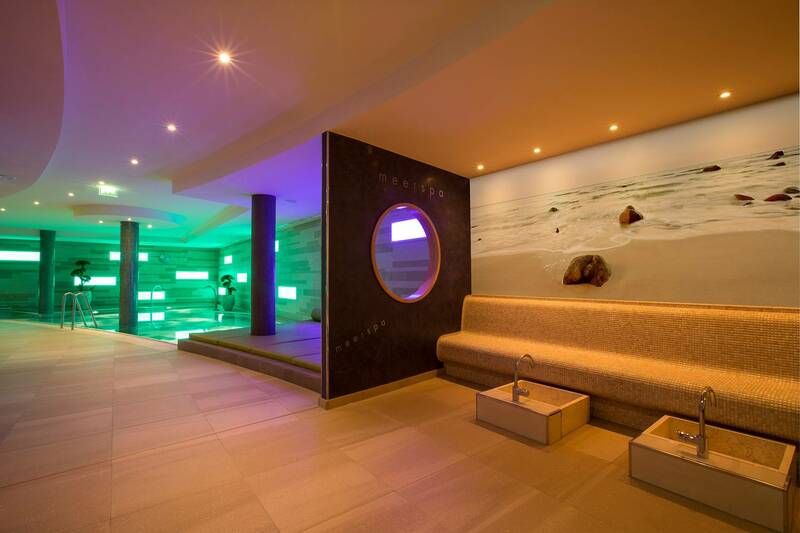 – Innovative product solutions and high quality materials on the one hand, the sustainable use of financial resources on the other – these were the considerations involved when it came to upgrading the spa at the ‘Hotel am Meer’ on Rügen Island. Wolfgang Schewe, owner of the 4-star superior hotel, is thoroughly familiar with his guests’ requirements and knows that, today, the quality of the spa facilities plays a crucial role when choosing a hotel. Just one more reason to offer his guests truly exceptional types of relaxation, by means of innovative technology and unique spa treatments. One company Schewe called on for its innovations and expertise was the premium manufacturer Kaldewei. 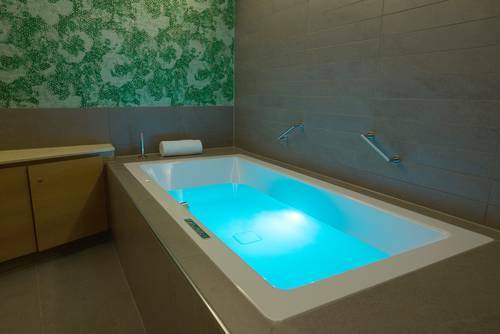 This means that guests can now enjoy a cosmetic bath with a rejuvenating effect, literally immerse themselves in their favourite music, or simply have a massage in the whirl bath. Talking to staff and guests, Wolfgang Schewe found out that they now want special spa experiences, and that there is ever less demand for classic bath treatments. He decided to make a careful investment in modern, innovative technology for his spa. While his guests benefit from the upgrade, his additional costs are largely refinanced by the range of individual pampering treatments that are now available. Following almost three months of upgrading work, the ‘meerspa’ has proved to be a big hit with its premium sauna, sanarium, steam bath and infra-red booth, and with interesting features. And, as the new branding already suggests, the hotelier has taken inspiration from the natural scenery of his Rügen home: large, sand-coloured tiles, green fabrics and other natural materials, colours and design elements bring the beach into the new ‘meerspa’, creating a unique, natural and soothing atmosphere. Guests at the 4-star superior hotel can now also enjoy a real beauty sensation from Kaldewei. As a world-first, it is now possible to book the cosmetic use of the Kaldewei Skin Touch in a hotel. Skin Touch delivers an exhilarating and restorative cosmetic bathing experience, during which the bathwater is enriched with millions of microbubbles of air. Thanks to the natural power of oxygen, the Kaldewei Skin Touch has a rejuvenating effect that leaves the skin feeling velvet soft and supple. The bathroom audio system, Kaldewei Sound Wave, provides a very special acoustic experience whereby the guest can literally immerse himself in his favourite music. Those who so wish can also treat themselves to the soothing massage jets of the Vivo Turbo Plus System in a Kaldewei whirl bath. All Kaldewei bathtubs are conveniently operated via the digital Comfort Select panel. Thanks to their innovative technical details, Kaldewei bathroom solutions ideally meet the demanding requirements of exclusive spas in the premium hotel segment. In addition, Kaldewei product solutions made of superior steel enamel offer the material advantages of quality, longevity and ease of maintenance. Hoteliers all over the world are placing their trust in Kaldewei’s quality promise that the manufacturer backs up with a 30-year warranty. Furthermore, by marketing individual applications, bigger investments in a modern spa fit-out are also worthwhile. “Our guests are very happy to use this new kind of beauty treatment and particularly appreciate the benefits of Kaldewei Skin Touch,” says a gratified Wolfgang Schewe. “For us too, this investment makes sense because we can offer our guests completely new and attractive treatments, thus recouping a part of our additional costs.” Last but not least, a premium fit-out in a hotel’s own spa is also a persuasive plus for discerning holidaymakers. Since early this year, the family-run Hotel am Meer on the Baltic island of Rügen has had an added attraction: under the guidance of hotelier Wolfgang Schewe, the relaxation oasis ‘meerspa | wellness & beauty’ has reopened after three months of extensive upgrading. After almost three months of upgrading, the ‘meerspa’ is proving a big hit with its premium sauna, sanarium, steam bath and infra-red booth, and its interesting features. 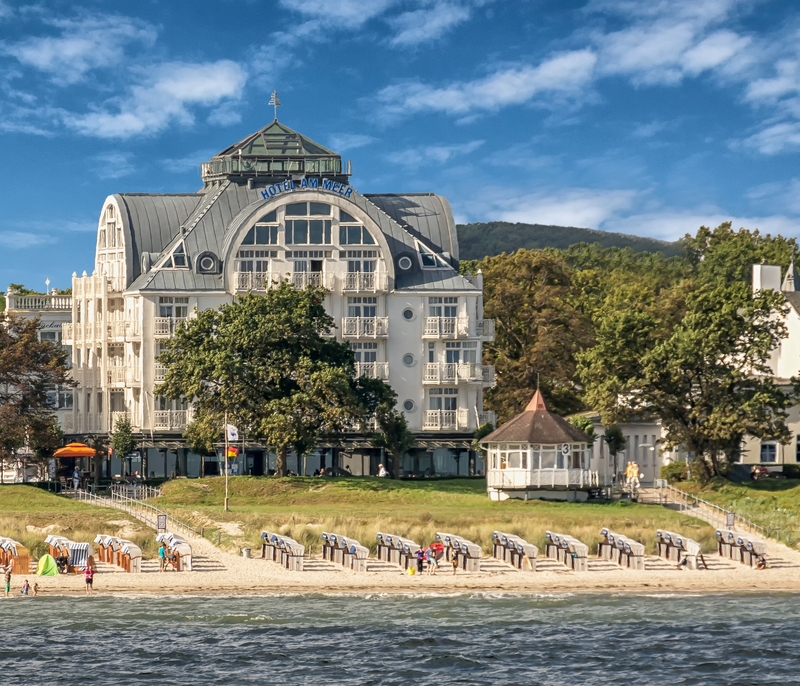 The first hotel worldwide with Kaldewei Skin Touch: guests at the 4-star superior “Hotel am Meer” can book Kaldewei’s beauty sensation as a cosmetic treatment at the hotel’s fully refurbished spa. The special feature of Skin Touch is that it uses the natural power of oxygen to produce an incomparable wellness experience with a rejuvenating effect.